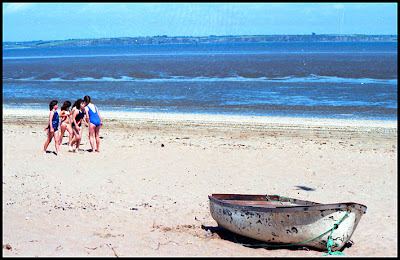 I took these photos on a beach in Woodstown, Ireland around 1984 and I've always loved them. I was trying to take a photograph of the abandoned boat. I didn't know those little girls, they were just running along the beach singing and dancing with the joyful abandon so often only known to children. 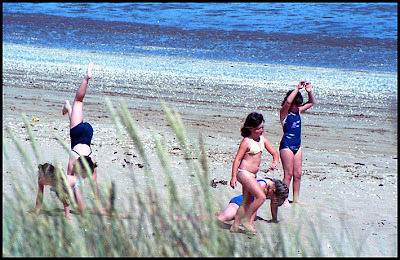 "Children" ha ha, I was only 17 years old myself at the time. a time to keep silent and a time to speak;"
I find myself treading water as of late and before the universe decides what's going to "give", I'm going to decide for myself. I'll be on an extended﻿ blog break for while. I know you all have been here (probably many times) and you understand so, bye for a little bit. Hopefully I'll see you when I get all this water out of my boat and feel like I can set sail again. Take care Jeanette, I look forward to you returning refreshed and revived. Be encouraged girlie - even Jesus Christ himself took time to get apart and spend quiet time alone to be renewed and refreshed. I just figure you are following the very best of examples. We will however, miss you while you are away. So very much love to you! Go have fun and enjoy! I'll be back here when you yell, "surf's up!!" we sing that hymn at church and it id gorgeous! lovely pictures Jeanette have a great weekend! we'll miss you! Hope it all gets better! I was just thing of you and wondering how the spring break was going and here is your post. The photograph is lovely as is the quote. Enjoy your time off, I will miss you so much!! Keep your head up and I hope everything is ok.
Jeanette - I'll miss you but hope you get caught up and I look forward to seeing you back again soon. I always loved the song to this verse. These are cute cute pictures, Jeanette, I crave Summer now. i've been there...i recently posted about it, if you scroll down the page...i know you'll make it. and i'll be here waiting when u do! I absolutely love candid photos such as these one. I have always enjoyed the quote too, very fitting with this post. Take it easy during your time off and enjoy it. Best wishes. Jeanette, I hope you are ok. Sounds like you are doing the right thing in taking a little time off. The photos are lovely and there is such joy in watching children play. Am thinking of you. If there is anything I can do, please email me. I would say "enjoy your break" however I know how busy you are with your new Etsy shop. Wish you all the success in the world! Take care Jeanette. Enjoy time for yourself and I'll look forward to reading when you get back! Jeanette, hope all is well with you. And we will be here waiting when you come back! The photograph is lovely - very joyful. Yes, we've all been there. Have a wonderful break and I look forward to your return! You'll be missed. Best of luck to you! I completely understand the need for a break! Love those pics (and that song). Can understand. Hope all is O.K. Looks like the sun is getting to the kids...getting red. The ocean is such fun and just one of God's many wonders. I really hope things calm down for you soon. I definitely understand feeling terribly overwhelmed with everything that's going on, and time can be such a precious resource. Keep us updated when you can! Hope everything is going well- it is not the same without you! I've been thinking about you. I hope you are well. beautiful photos - best wishes for your little brea. everyone needs one once in awhile. Every good wish - j.
I miss you. Come back soon. Hey Jeanette, just me again. You weren't kidding about an "extended blog break", lol! Jeanette of course and we will all be here! Sometimes we need to be away from all of the noise and distractions. I've been missing you. How ironic to come here this morning and note your boat is leaky, too. I feel myself in good company.